Daltile 2 x 2 M..
Italian White Carrara marble 2 in. x 2 in. octagon mosaic tile is perfect marble tile for any accent wall or floor covering project. This white Carrara Marble tile comes in the form of 12” x 12” mesh mounted mosaic sheet, which approximately covers 1 sqft. 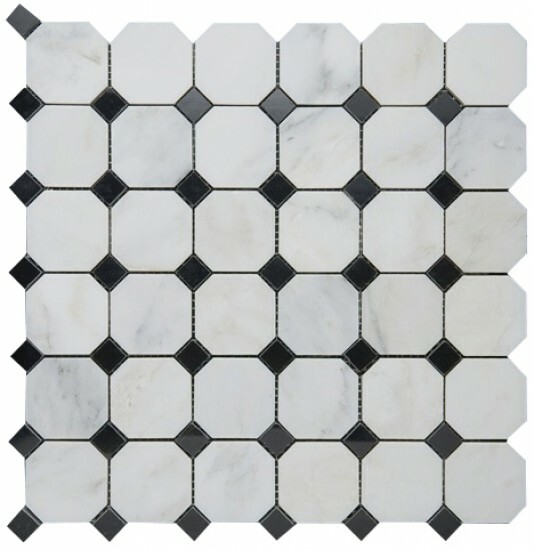 This Carrara Marble mosaic tile has 36 chips of 2” x 2” octagon set in octagon and dot format. This tile is honed finish which makes it muted and less slippery, the characteristic makes it suitable for shower floor. This black and white octagon tile is suggested for installation in kitchen backsplash, bathroom flooring, bathtub surround, accent wall tile. Our premium white octagon mosaic tile comes with a large selection of coordinating products such as 12x12, 18x18, 24x24 soild field tiles, subway tiles, trims & moldings, borders and much more. Chip Size: 2 in. x 2 in.